Enlarge View 6 images in sequence. - Vol. 8, no. 8 (Dec. 22, 1942)-v. 27, no. 18 (Oct. 23, 1945). - Published by the War Relocation Authority. Poston Chronicle . (Poston, AZ), Aug. 27 1943. https://0-www.loc.gov.oasys.lib.oxy.edu/item/sn83025333/1943-08-27/ed-1/. 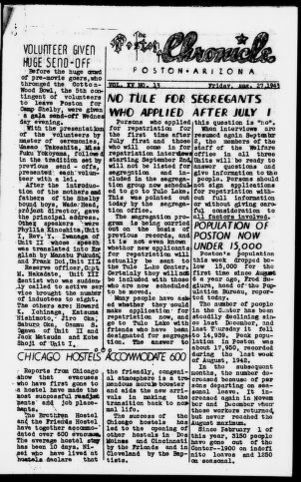 (1943, August 27) Poston Chronicle . Retrieved from the Library of Congress, https://0-www.loc.gov.oasys.lib.oxy.edu/item/sn83025333/1943-08-27/ed-1/. Poston Chronicle . (Poston, AZ) 27 Aug. 1943. Retrieved from the Library of Congress, www.loc.gov/item/sn83025333/1943-08-27/ed-1/. Yuma and Yuma Valley, a true pictorial story of the most promising city and the most ... Also available in digital form. Freight train going east near Yuma, Arizona 1 negative : nitrate ; 2 1/4 x 2 1/4 inches or smaller. Migrant family stopped at the California-Arizona state line to have their baggage inspected for plant pests. ... 1 negative : nitrate ; 2 1/4 x 2 1/4 inches or smaller.